We track down every shipment, which enters into Ethiopia via sea, air or road. As and when we start receiving shipping information such as Bill of Lading details from our most trusted sources; we quickly update our largest database with the latest import data of Ethiopia. Our experienced team of people begin verifying every trade statistics and shipping records in order to make sure that you always get accurate and authentic customs data of Ethiopia. We help you to see a larger trade picture of Ethiopia imports from an eye of our data analysts, financial experts and industry specialists. They do a market analysis from import data of Ethiopia and generate trade reports for you to transform your import export business. On our website, you can go through our samples of various traded products so that you can find which data fields we cover in shipping records. Through our updated database, we are able to answer your trade questions including – Who is Importing in Ethiopia, From Which Port, Shipment is Taking Place, What is the Value of Shipment and so on. We have simplified your data hunt by allowing you to search sample of Ethiopia imports through HS Classification, Product Description or a combination of both on our website. We present a reliable & quick-responsive platform for you to go through our sample of Ethiopia import data deeply and understand which data fields are covered in it. This will help you in taking the right business decision to get trade data of Ethiopia from us. So, have a look on these two samples and fill up an enquiry form to get complete shipment records of Ethiopia imports. As per the report, the country imported machinery, nuclear reactors and boilers under chapter 84 the most in 2015. See the chart and table below for knowing 10 largest import products of last year. China stood as the largest import partner of the country in 2015. And India stood as the 3rd largest import partner of Ethiopia. 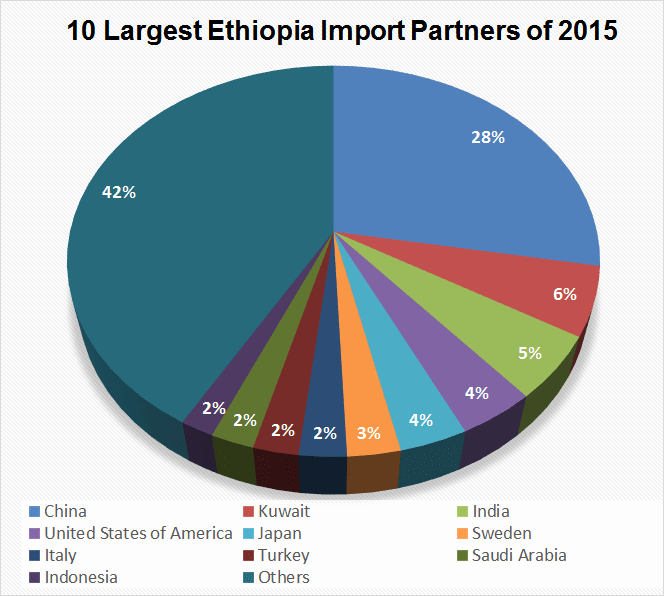 To get the trade statistics of Ethiopia’s 10 largest import partners of 2015, see the chart and table below. While looking at Ethiopia import data of 2015, the country’s import value of total products rose to USD 25815264000 from 2014’s USD 21914374000. 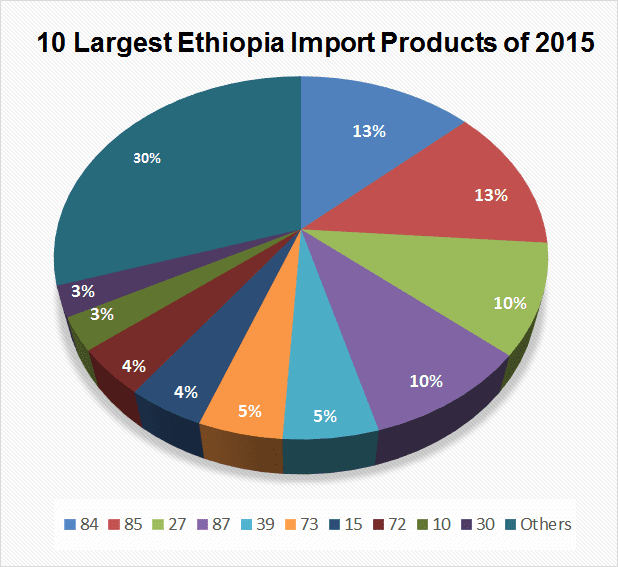 To have bigger import trade picture of Ethiopia, see charts & tables below in which you will find import figures of total products of last 10 years along with month-wise import data of year 2015.